Rendering courtesy of Oxford Development. Since breaking ground in 2014, the 3 Crossings development has quickly added a wide variety of living, working and shopping spaces to the Strip District. Today, the complex includes 300 apartment units and four office buildings housing clients like Apple and Argo AI. 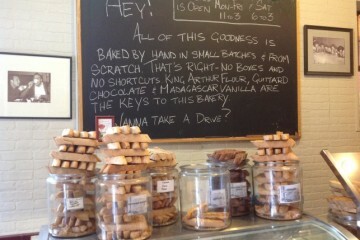 But far from slowing down as the property fills in, the owners at Oxford Development say they’re just getting started. 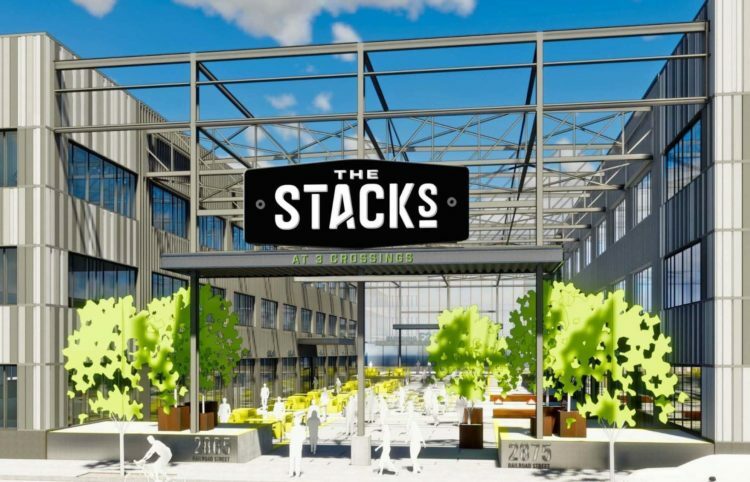 Earlier this week, Oxford revealed plans for The Stacks at 3 Crossings, a pair of three-story, 55,415-square-foot workspaces located at Railroad and 29th Streets on the site of the former Packaging Corporation of America. Work is still underway demolishing parts of the current building. The project has yet to be formally proposed to the Pittsburgh Planning Commission, so exact start and end dates for the construction are unknown at this time. Megan Stearman, director of marketing for Oxford Development, says they expect the two offices to be finished by the fall of 2019. Stearman says The Stacks are just the second phase of a much broader expansion of 3 Crossings that will take place over the next five years. The long-planned expansion includes several more offices and hundreds of new apartments in the area around The Stacks. The project will incorporate the site’s existing industrial architecture by converting two of its former warehouse frames into offices, and demolishing the third to create a public plaza between the two buildings. In addition, project leaders say they plan on moving the erstwhile factory’s iconic hopper into the plaza as a kind of monument to the neighborhood’s industrial past. The site of the proposed Stacks at 3 Crossings from across the Allegheny River. The Hopper, pictured, will be moved slightly to a public space between the two proposed office buildings. Photo by Tracy Certo. 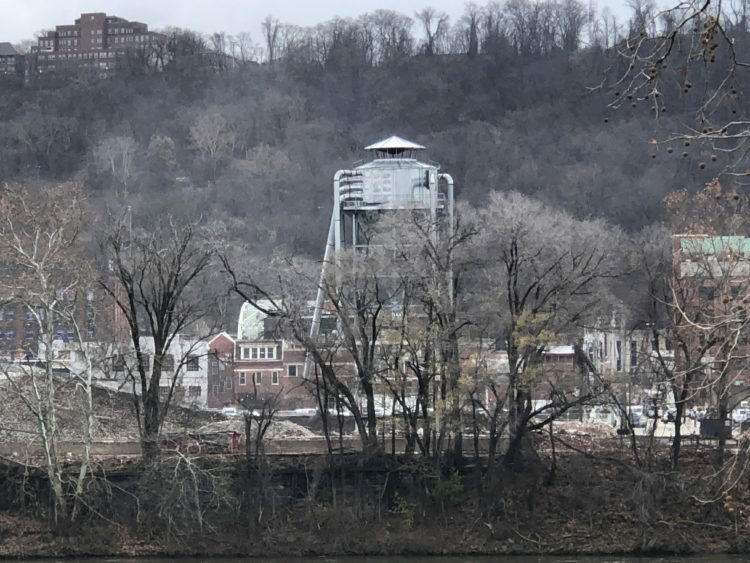 Stearman says her organization hopes to continue expanding the public riverfront trail they’ve already developed in that area of the Strip, but such plans will require further discussions with the city and other landowners along the Allegheny. The last several years have seen something of a building boom in the Strip District, as the increasingly vacant warehouse and industrial spaces of the neighborhood lend themselves to ambitious, mixed-use developments. 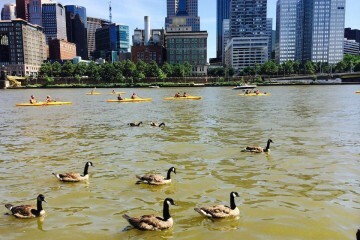 In addition, the city has moved to beautify and redevelop the Strip riverfront into public space. Stearman also says the company seeks to create living and working spaces that are integrated into the larger Strip District community and its riverfront.